Andy’s career started when he became an apprentice PSV mechanic with The Bristol Omnibus Company. Following his time at the Omnibus Company he took a position with Silver Arrow an ERF dealership as a mechanic working on commercial vehicles. He moved on from Silver Arrow to Avon Cranes where he has been for the last twenty-eight years putting his wealth of experience to good use in the workshop and on site and he now holds the position as workshop Forman. Avon Crane & Commercial Repairs are the FASSI main dealer for South West England. We are an ALLMI member with over 35 years’ crane experience, operating a fleet of vans for mobile support. We have been a FASSI authorised service partner since 2012, and Ben James and his team of engineers have built up a wealth of FASSI knowledge in that time. 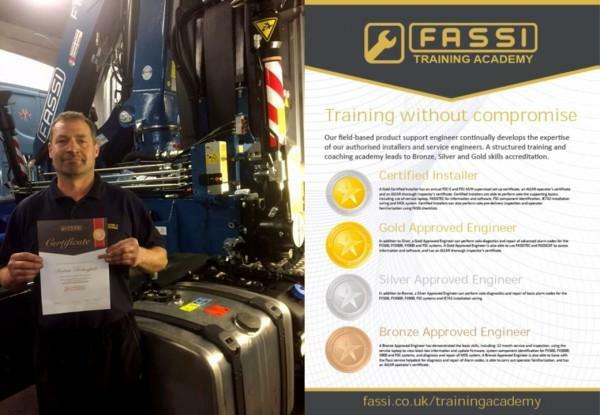 The FASSI training academy is a structured training and coaching program leading to Bronze, Silver and Gold skills accreditation once the necessary skills have been demonstrated. It represents an investment in the installation, service & repair of FASSI cranes.